My recent book Money, Taste, and Wine: It’s Complicated has been short-listed for two Gourmand International awards.. The winners will be announced in ceremonies in Yantai, China later this month. The awards are for best wine book and best wine writing. I’ll paste the list of finalists in these categories below.Click on this link to see all the award listings. Thanks to Gourmand International for this honor. Congratulations and good luck to all the finalists. I’ve just learned that my new book Money, Taste, and Wine: It’s Complicated has won an international award for best drinks writing in a U.S. book this year. The award comes from Gourmand International and will be presented in Yantai, China on May 28, 2016 at the annual awards ceremony. As the U.S. winner, Money, Taste, and Wine is a finalist for the “Best in the World” award in this category, the winner of which will be revealed in Yantai. Very exciting! The other national finalists and winners in other categories of the awards will be posted on Gourmand International website in February. Sincere thanks to the Gourmand International judges for this honor. Here is a video about the 2015 awards in Yantai. Enjoy! Just a quick note to tell you that The Wine Economist has been short-listed for a global blog award. 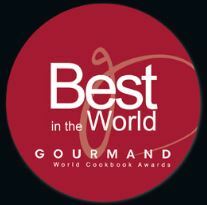 The Gourmand International “Best in the World” awards will be announced on June 8 in Yantai, China. I’ll copy the short list of blogs, magazines and “books of the year” (one finalist per country) in the “wine and drinks.” category. 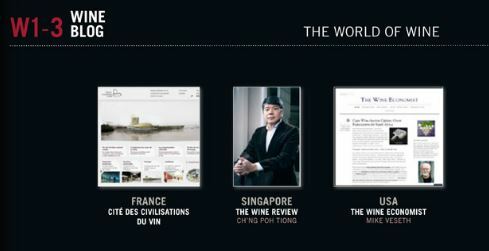 The Wine Economist is in good company, don’t you think? It’s an honor just to be nominated for this award and a double honor to make the list of finalists! Thanks to Gourmand International for this recognition (and thanks to whoever nominated The Wine Economist for this award!). Next week — on Memorial Day, in fact — the Wine Economist will celebrate its 10th anniversary. Ten years of regular columns about the world of wine as seen from an economist’s perspective. 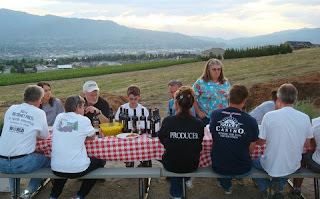 The very first column, which is reproduced below, was an account of my visit to family-owned Fielding Hills winery, one of Washington’s best, to help bottle the 2005 vintage. 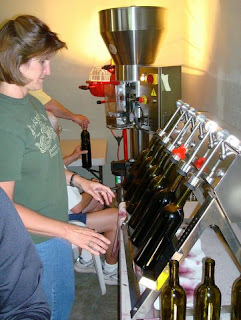 The bottling line was a volunteer operation back then, fueled by enthusiasm and steady sips of the wine, which I compared to Adam Smith’s famous “pin factory” example of the benefits of division of labor. A lot has changed since 2007. Fielding Hills’ reputation has grown, its lineup of wines expanded, and the cramped garage-style winery replaced with an efficient production facility and beautiful tasting room over-looking scenic Lake Chelan. A lot has changed at the Wine Economist, too. I could never have guessed that this first column would slowly and with much effort turn into something more, spinning off four wine books, several awards (wine book of the year, best wine blog, best wine writing) and a series of lectures that has taken us around the world. Amazing! Tenth anniversary? That calls for a celebration. 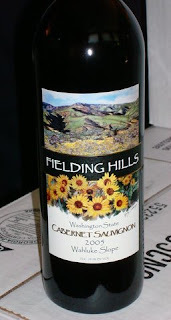 I think we’ll open a bottle of Fielding Hills wine! Cheers to the Wade family and Fielding Hills for getting this column off to a good start. Because they have been so successful, both in terms of wine quality and wine economics, the Wades are planning to take the next step — to expand production from 800 cases to 2400 cases. This is a big step, since the business model changes with the higher volumes. Family labor plus volunteer help at key points works fine for wineries producing 1000 cases or less, but a bigger operation means hired help and higher fixed costs. The marketing end changes, too. The Wades prefer to sell most of their wine direct to customers rather than to discount it in order to get it into wine shops and restaurants. Given their stellar ratings, they have a good opportunity to build a “wine club” list that will automatically take most of their output, matching demand and supply very efficiently. Building a bigger winery will mean matching a bigger demand to their bigger supply. 2015 was a busy year here at The Wine Economist and 2016 is shaping up to be pretty interesting, too. In January I spoke in the “State of the Industry” session at the Unified Wine & Grape Symposium in Sacramento. Then we left for New York City where I spoke at “Vino 2015,” a conference and trade show organized by the Italian Trade Commission. It was really really cold in Ontario when I visited in March to speak to the Winery & Grower Alliance of Ontario meetings, but the people were warm and it was a great experience. Then a quick trip to Walla Walla to talk about wine industry at a regional business summit. South to California in May, to speak at the Ramona Valley AVA symposium, then a fund-raiser for the Admiral Theatre Foundation in Bremerton along with my friends from Hedges Family Wines. Sue and I were delighted to be invited to the 50-year retrospective tasting of Oregon’s Eyrie Vineyards in Portland, too. June’s highlight was lecturing at the Conegliano Wine School in Italy and visiting with winemakers in the Veneto and Friuli.While we were in Cormons I got word that around the globe in Yantai, China the Wine Economist had received the Gourmand International prize for the “Best in the World” wine blog. Incredible. Back home it was north again in July, to speak at the British Columbia Wine Institute annual meetings, then south to Napa Valley to talk at the California Association of Winegrape Growers summer conference. Two books came out in the fall, my newest volume Money, Taste, and Wine: It’s Complicated and the paperback edition of Extreme Wine. We visited Barboursville Vineyards while in Virginia to meet with Luca Paschina and we were lucky to able to meet up with Marc Hochar in Richmond and taste some older vintages of Lebanon’s Chateau Musar on the same trip. I spoke at the Seattle meetings of the Academy of International Business and then flew to Milan to participate in a discussion on sustainability organized in conjunction with the big SIMEI trade show there. The year ended on a high note when we learned that Money, Taste, and Wine will receive the Gourmand International award for the year’s best wine writing in a U.S. book. As the U.S. winner it is a finalist for the “Best in the World” award to be revealed in Yantai, China in May 2016. The travel schedule is coming together for 2016. I am looking forward to going back to Sacramento at the end of January for my fifth year moderating the “State of the Industry” program at the Unified Wine & Grape Symposium. 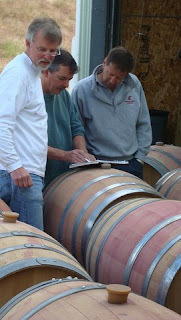 A few weeks later we will head to Napa where Sue and I are on the faculty for the Professional Wine Writers Symposium. Then it is north to Anchorage for another World Affairs Council fund raising program before returning to Walla Walla for the big Reveal Walla Walla trade auction. It looks like we will be going to Portugal in May to speak at a conference organized by Wines of Alentejo and later to Seattle for Riesling Rendezvous, an international conference sponsored by Chateau Ste Michelle and Dr Loosen. That’s what’s on tap for 2016 so far, but the year is still young. No wait — it actually hasn’t even started yet. Who knows where the wine rivers and roads will take us. That’s the look back and ahead. Hope to see you somewhere on our travels in 2016. In the meantime, cheers to all! And have a great New Year. Sometimes I feel like I have been everywhere in the wine world to speak to wine industry groups, but the truth is … I’m not even close! Welcome to Money, Taste, and Wine: It’s Complicated!, my new book about the incredibly fascinating world of wine, which received the 2016 Gourmand International awards for best U.S. wine book and “Best in the World” wine writing. “It’s complicated!” That’s a simple way to describe the sort of relationship that seems to defy simple explanations. Like one of those romance novel love triangles, money, taste and wine are caught up in a complicated relationship that affects every aspect of the wine industry and wine enthusiast experience. You will find Money, Taste, and Wine and the other wine books by Mike Veseth at all the usual online and brick-and-mortar locations (click on the Amazon, Books-a-Million, IndieBound, Powell’s or Barnes & Noble button to order your copy today). As wine economist and best-selling author Mike Veseth peels away layer after layer of the money-taste-wine story he discovers the wine buyer’s biggest mistake (which is to confuse money and taste) and learns how to avoid it, sips and swirls dump bucket wines, Treasure Island wines and toasts anything but Champagne. He bulks up with big bag, big box wines and realizes that sometimes the best wine is really a beer. Money, Taste, and Wine is a great read; entertaining, informative and heartfelt. Like Wine Wars it is packed with economic and historic insights into the world of wine. At times I found myself laughing out loud and also reaching for my notebook to jot down facts and add (wine and non-wine) books to my reading list. Written in Mike Veseth’s ineffable style, Money, Taste, and Wine goes down as easily as the finest pinot, will make you laugh, and fatten your wallet. If you’ve ever suspected that wine’s pricing is rigged, fumed at stratospheric restaurant tariffs, or want to be amazed at how the revolution in global trade has affected your favorite drink, then look no further than this book. A must for any consumer of the fruit of the vine. I laughed out loud several times reading Mike Veseth’s new book, Money, Taste, and Wine. He has such a humorous and down to earth style when writing about wine, and this new book that involves romps through the supermarket aisles, restaurants and discount stores to find a good deal on wine is hilarious at times. It also has its serious points, and provides useful information for wine lovers in analyzing their own palates and expectations. A definite read for all wine enthusiasts, wine students and wine newbies. Who is the wine buyer’s biggest enemy? What is the wine buyer’s biggest mistake? Why is “know thyself” the best way to overcome the wine buyer’s biggest mistake? Do you sometimes wear your underwear inside-out (to avoid the itchy seams)? What does your answer to this question say about your taste for wine? Why do Parisians like not drinking wine and what does this have to do with the money-taste-wine trilemma? What’s the difference between dumped wines and dump bucket wines (and why should bargain hunters seek out one but not the other)? Are “second wines” a good deal? How do Costco, BevMo and Total Wine use different Treasure Island wine strategies to produce happy customers and strong wine sales? How big of a choice do U.S. wine consumers really have (and why is this a complicated question to answer)? Why is the best wine sometimes a beer or a cider and what are the implications for the wine industry? King Midas had the golden touch. What did he drink and how do we know? How are big bag, big box wines changing the global wine business? If you can’t judge a book by its cover, why do so many people judge wines by their labels (and does this mean that cute kitty wine labels should be outlawed)? What do wine snobs and cheese bores have in common? And how does the globalization paradox explain them both? Wine in restaurants is one of those love-hate things. What’s the key to winning the restaurant wars? When is the best time to invest in wine? Some wines are so scarce that money cannot buy them — they are almost imaginary. What do truly imaginary wines taste like? The money-taste-wine relationship is both complicated and powerful. Can it really change the world? How? 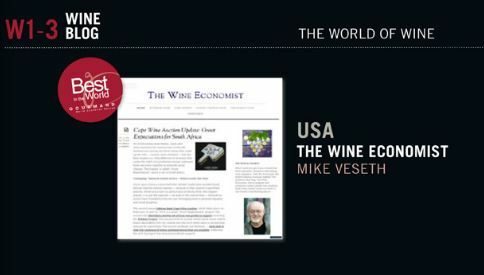 Mike Veseth is a leading authority on the global wine business. He is editor of The Wine Economist blog and author of a dozen books including Extreme Wine (2013) and Wine Wars, which was named a 2011 Wine Book of the Year by JancisRobinson.com. Mike is emeritus professor of International Political Economy at the University of Puget Sound in Tacoma, Washington. Mike is currently working on his next book, Around the World in 80 Wines, when he isn’t actually traveling around the world with his wife, Sue, looking for great wines, great wine stories and speaking at wine industry conferences.